Coordinator: George Childs (cell/text 587 280-8877) See contact info below to RSVP via email. Location: Vegreville (about 100 km east of Edmonton on Highway 16) – meet at the Pysanka (the big Egg at the east end of town) at 10:00 am. Take the Highway 16A exit to Vegreville and you will see the Pysanka as you drive through town. Cost: No cost, but bring your own lunch or you can buy lunch from the grocery store or restaurant in Two Hills. This will be a supported ride and will be held weather permitting. A mini-van will be available for carrying water, lunches and small personal items. Description: The route will go north from Vegreville on Highway 857 to Highway 29. Turn right on Highway 29 and continue to Highway 45 and on to Two Hills (about 55 kms). Take a lunch break in Two Hills and return to Vegreville via Highway 36 and Highway 631 (about 45 kms). The first part of the route is flat but as you approach Two Hills and return to Vegreville there are a few rolling hills. This is not a difficult ride but expect a headwind for some of the ride. Traffic along the route – light to moderate. Riding route – good – narrow shoulder on Hwy 857 for about 30 km, good riding shoulder for the rest of the route. Pavement is in good to excellent shape. A route map will be provided at the start. Showers are available at the end of the ride at the Town of Vegreville Campsite, located adjacent to the Pysanka. If you are interested in checking out Vegreville’s Ukrainian heritage at the end of the ride this is the last day of the local 3 day Ukrainian Pysanka Festival. Admission to the festival grounds is free and there are several spots to sample some delicious authentic Ukrainian food. Please let the coordinator know by email if you are planning on attending. 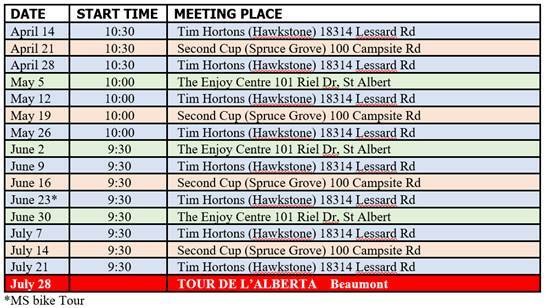 Saturday – We will make our way to Vermillion Lakes Rd in Banff to begin our ride. An 83k out and back ride along the Bow Valley Parkway all the way to the Continental Divide along Highway 93. Lunch will be at Vermillion Pass BC before returning the same way we came. This is an unsupported ride, so make sure you have all you need in case of minor bike issues. Drivers will need Park Passes. Food: It is recommended that you have supper before arriving to the hostel Friday night. You will need to plan for two breakfasts, two packed lunches and snacks for the trail/ride and supper on Saturday night at the hostel, unless we decide to go out! Transportation Edmonton to Canmore and Return: Ride sharing is encouraged. Description: Pack your passports for this international bicycle tour as we go through some of the finest terrain that Canada and the U.S. have to offer. From picturesque New Denver, British Columbia, we’ll head through several fascinating small towns before crossing the U.S. border into Washington State, where we’ll follow the Pend Oreille River through Metaline Falls down to Priest River, Idaho. We’ll end up spending a well earned rest day in Sandpoint, then sip up to the most northerly section of the Idaho panhandle before crossing the border back into British Columbia. Join us for this memorable ride amidst sparkling waterways, pastoral countryside, and spectacular mountain terrain! Cost: $1,350.00 per person. Includes all accommodations, van support, snacks on the road, and all breakfasts and lunches (ride days only). Does not cover the cost of dinner each evening. Registration: $500.00 deposit is required through Karelo – – registration opens March 1st, 2019. You must be a 2019 EBTC member to register. Balance of trip fees ($850.00) are to be paid directly to the Ride Coordinator, by way of personal cheque or electronic money transfer, no later than May 31st, 2019. Note: Participants should ensure they are familiar with the EBTC refund policy regarding rider cancellations. Please contact the Ride Coordinator if you have any questions. Location: Ride begins/ends in New Denver, British Columbia. Each participant is responsible for getting themselves and their gear to the start point and home once the ride is completed (car-pooling is encouraged). Group parking will be available in New Denver. Driving distance: Edmonton to New Denver is approximately 850 km (w/ferry crossing). Coordinator: Ed Weymouth at steadeeddie58@gmail.com or 780.489.7711. A pre-trip meeting will be held – – date/time to be determined. Registration will be via Karelo! Edmonton is blessed with an abundance of traditional and ethnic bakeries, and we will enjoy a few. We will be exploring the NE part of Edmonton, so we’ll meet on the north side of town. I’ll pick up some donuts to go along with your mid morning (or early morning for some) cup of coffee. There is a Second Cup just across the parking lot. We will be leaving at 10:00 am SHARP, so arrive earlier if you plan on a morning snack, say 9:30. We will be meeting at the office building where I sometimes work, so there is lots of parking. It is the black 5 story twin towers at 14310 – 111 Ave. It is just west of the Space Science Centre, across 142 St. We’ll park on the east side of the building. We will be riding on city streets, and bike paths where convenient. The group should stay together for safety and to be sure nobody gets lost, so will likely be a slow rather than fast pace. We’ll ask someone to act as a sweep to help keep us together. Oh, remember to bring a pannier or two , or a backpack to take some home some pita and goodies to enjoy at your leisure. We will stop for lunch likely about 12:30 to feast on baked pita, and then continue our quest for more decedent pastries. Even if you are on a diet, come out and enjoy a day of exercise on your bike. We will likely be back to the start point at 2:30 to 3:00. Description: We will explore Edmonton by bike. While exploring, we‘ll happen upon some bakeries. Added information: We will provide transportation for your camping gear from Waskatenau to the campsite and then back to your vehicle on Sunday. Julie will be driving sag in case of mechanical or rider issues. Bring your first day lunch on the bike. Dinner, breakfast, and Sunday’s lunch will be provided by the ride leaders on a cost sharing basis. 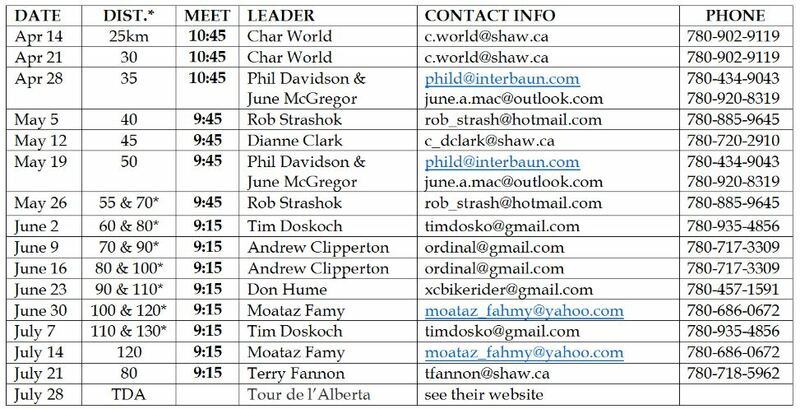 RSVP to safety.education@bikeclub.ca prior to May 22, to ensure a spot.